The T07 Stick PC box is powered by the quad-core 64-bit Intel© AtomTM x5-Z8350 Processor at 1.44Ghz with a turbo frequency of 1.84Ghz. The CPU features the latest 14nm manufacturing process and Gen8 Intel© HD Graphics. The CPU is backed by 2 or 4GB of LPDDR3 RAM and an active fan cooling system. 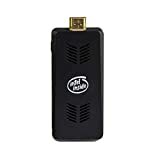 This entry was posted in Computer Desktops and tagged 32GB, Black, Bluetooth, Compute, Intel, Licensed, MeeGOPad, Mini, Small, Stick, Version, WiFi, Windows, x5Z8350 by Express Computer Supplies. Bookmark the permalink.